The Royal Brisbane and Women’s Hospital (RBWH) is a 1,023-bed hospital close to the Brisbane central business district. RBWH is a key provider of health care services for Queensland Health that provides care on several specialties including medicine, surgery, orthopaedics, obstetrics, gynaecology, neonatal intensive care, and trauma services. The laboratory at the Royal Brisbane and Women’s Hospital is the largest metropolitan pathology support service in Queensland Health and one of the largest in Australia. The RBWH laboratory receives three deliveries from the Australian Red Cross Blood Service (the Blood Service) daily at 0900, 1500 and 2030. RBWH laboratory receives more than 2,000 RBC units per year from other laboratories, including Mount Isa and Longreach. 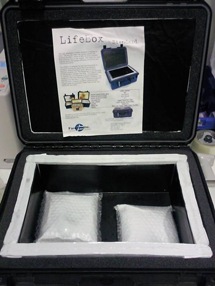 RBWH supplies two units of O negative RBCs to Brisbane Ambulance Service that are transported in a specially validated shipper, the ‘LifeBox’, for up to 64 hrs (see images of Lifebox below). RBWH has implemented a single unit policy (i.e. provide one unit of blood, and reassess the patient for clinical symptoms before transfusing further units) which has resulted in a reduction in units transfused without compromising patient outcome. participating in jurisdictional meetings on blood-related matters. appropriate use for blood and blood products with a view to minimising blood-related costs, encouraging compliance with national guidelines and standards, and improving wastage levels. 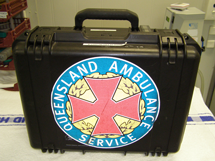 the project included the funding of 5 transfusion nurse positions in some of Queensland largest public hospitals (Gold Coast, Royal Brisbane and Women’s, Nambour, Townsville and Cairns). ‘appropriate use’ audits were conducted / bench marked and reported to hospital executives with the transfusion nurses driving change practice initiatives (single unit red cell transfusion) which saw fresh component usage at the project sites decline dramatically over the project term. ongoing collection and reporting of fresh and fractionated component usage/trending incorporated into regular reports to executive level management and clinical units. The RBWH has validated a shipper for use within the hospital that allows RBCs removed from the Blood Bank fridge to be maintained in the clinical unit for up to 2 hours before needing to be returned to refrigerated storage. Theatre has been the main beneficiary of this process as it has not only reduced the amount of time dedicated to managing blood components but has also dramatically reduced wastage rates in this area (clinical staff were removing units to check details and then replacing units directly onto icebricks). Blood components are booked out to the clinical areas one unit at a time making returns of components to Blood Bank a rare occurrence. The time of despatch is added to the ‘crossmatch’ form so ward staff have an awareness of the ’30 min rule’ and know how long the unit has been out of the blood fridge. For ease of reference, useful information regarding the safe transport and storage of blood and blood components is available on a poster in the RBWH laboratory. A copy of this poster is available for download. With the implementation of the above processes, the RBWH pathology laboratory is achieving wastage levels for red cells in the order of 2.5% (year to date, April 2013).